It has been 11 weeks since I started my One Year Lifestyle Commitment. Every Wednesday I record my weight as a diary entry in my phone. It is interesting how weight fluctuates every day, confusingly, but the week by week results are very consistent. For the past 11 weeks, I have lost an average of 1.2 kilograms (2.6 pounds) a week. The first two weeks I lost 2 kilos a week. Then it slowed down to a steady kilo or so. I’ve now lost 13 kilos! My daughter, Rachael, told me - at the rate I’m going, I’ll reach my goal by Easter next year. How cool is that? I gave some of my biggest shirts away last night at Vive Cafe. There is a big guy there who asks for updates on my success every week. Last Thursday he asked if he could have my shirts when I got too small for them. So, last night I gave him my largest three! Yippee! Feels great to be shrinking. I’ve explained part of my strategy in past posts, but here’s a bit more of my thinking about steady weight loss. 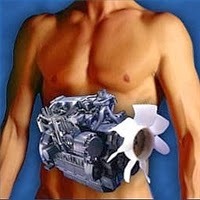 The body is a hybrid engine. I don’t want to be a bigger barn! So, the key is - keep System 1 kicking on and off with great fuel in small doses. That will cause System 2 to kick in more often when it needs something to keep chewing on. When your body is in fuel burning mode, it wants to burn fuel. When it is in fuel storing mode - it wants to store fuel. When it’s in starvation mode, it wants to conserve fuel. Eating one or two huge meals at the beginning or end of the day is a great way to jump between storing mode and starvation mode. Not good! We want our body to be in fuel burning mode - and running out of System 1 fuel as often as possible. So, graze don’t gorge. Sample don’t starve. Find some healthy fuel that you enjoy and then find a way to eat it in small doses. There are basically three kinds of System 1 fuel. Carbs, Fats, and Protein. Most foods are a combination of two or all three. Fats are longterm fuel - they provide for System 2 by storing up until you don’t have carbs or protein in System 1. There is way too much fat in our modern diet therefore we store way more than we will ever use. Carbs are slow burning fuel - they keep you feeling full and your System 1 working longer before getting hungry again. Carbs are great for when you are planning on using your muscles - before a long walk, swim or bike ride. If we don't exercise, carbs ensure we make it from one meal to the next without turning on System 2. Protein is the System 1 turbo-booster - it burns hot and fast. Protein makes your body switch on System 2 quicker and more often. Protein makes your body believe the grass is greener RIGHT NOW. So, burn baby! The current obesity epidemic around the world is due to the modern high fat/carb diet. Fat and carbs are in nearly every packaged product. Most processed fat is bad for us. And our need to use carb energy has gone down (due to vehicles and desk jobs). Very few of us are walking (up hill both ways!) to school, harvesting grain with a scythe, climbing a mountain to buy milk, etc. We just get our food handed through our car window as we drive to our destination. There are a few things we can do to get our bodies working right while not going back to 1850. First, for those of us who are overweight, we need to get system 2 working overtime, we need to get our body believing it needs to chew the fat. The best way to do that is to keep System 1 running and then running out - over and over - all day long. Put food in your mouth every couple of hours. That’s a great idea, isn’t it? Sounds yummy. And it can be! By putting food into our engine - the right kind of food, in the right quantity - we can get our Engine CoSystem Regulator (metabolism) working at it’s peak. When we starve ourselves our metabolism goes into starvation mode - even if we are obese! The system believes we are going to die because the food has stopped coming. So, it hordes every molecule it can salvage, converts it to fat, and sticks it to the wall. It burns slower, saves energy wherever it can and often even stops asking for food. It just goes to sleep. This is NOT what we want. Every couple of hours, have a piece of fruit, a ProOatTeen Patty with something yummy (preferably protein) on it (flavoured tuna, chicken breast finger, marmite, poached/fried egg), another piece of fruit, or a small meal. I eat three patties (with something on them) each day, two or three pieces of fruit and a small meal - each an hour or two apart. Each day is a little different - this is also important. My body is happy because it get’s bits of food often but I’m not bored or sick of a labourious routine. Once a week or so, I replace a patty with a trip to the nearest sushi place. I take a lunch box with me each day. In it is the patties, toppings and fruit for the day.